Although James Gray‘s The Immigrant has yet to premiere at this year’s Cannes Film Festival, audiences got a taste of his work with the crime drama Blood Ties, which bowed over the weekend. Co-written by the Two Lovers helmer the film marks the English-language debut of Guillaume Canet (Tell No One) and we’ve now got the first trailer. While response was mixed out of the festival, this look impresses, with Canet seemingly effectively capturing the 1970s Brooklyn aesthetic in a sprawling fashion. Featuring Rust & Bone stars Matthias Schoenaerts and Marion Cotillard, as well as Zoe Saldana, Mila Kunis, Clive Owen, Billy Crudup and James Caan, the story is a remake of a 2008 thriller, which follows two brothers who are different sides of the law that team together. Check out the trailer and poster below thanks to Mars Film. 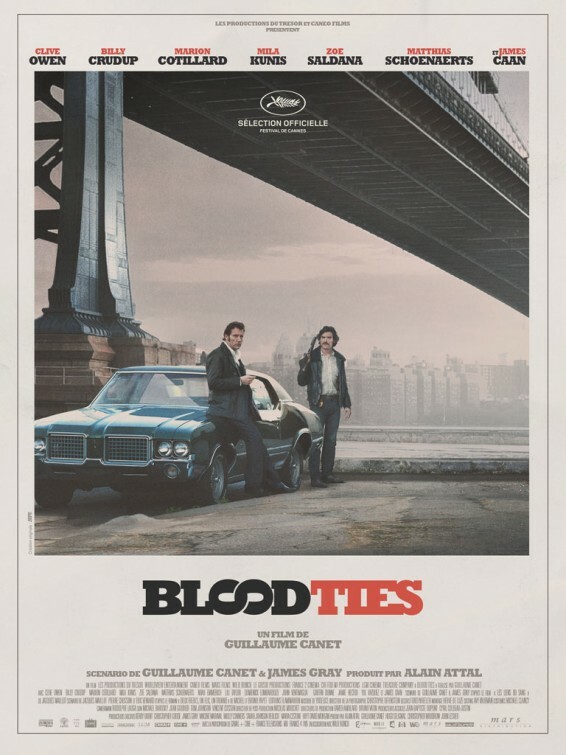 Blood Ties has yet to secure U.S. distribution, but with hit France theaters in the fall.